Great blue herons photographed by Mike Munroe (top, right), Brandon Harvey (centre left), and Brian Starzomski. 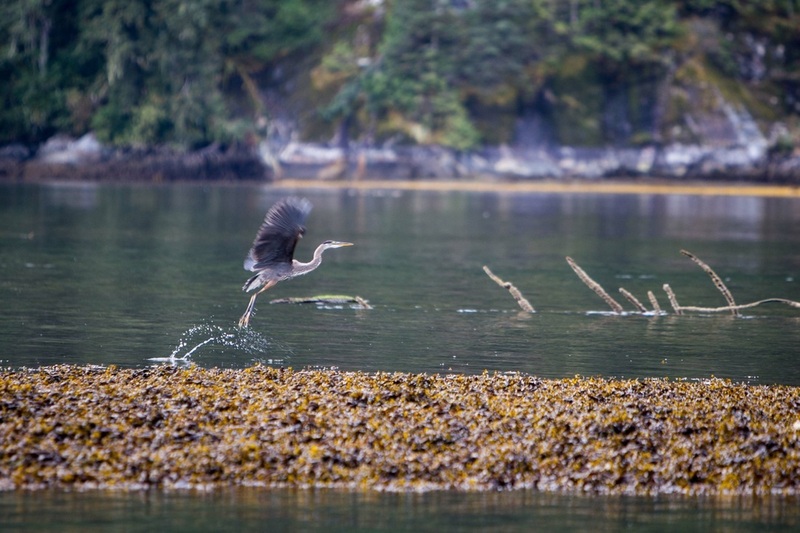 This large distinctive bird is often seen near water looking for its next meal. It moves with large, slow steps and wing beats, but is quick to catch the fish and other animals upon which it preys. It is grey-blue all over, with a black stripe over each eye and black stripes on its white throat. Its bill is long, straight, and yellow. Breeding adults have plumes on their heads, chests, and wings, and juveniles have a black cap rather than stripe. Click here for some incredible photos and more information about this species. This bird can be found in a variety of fresh and saltwater habitats, including along the coast, riverbanks, lakes, and marshes. Its winter range stretches across the southern United States and Central America, with summer breeding grounds in the centre of the continent. Year-round populations are found across the eastern part of the US, and along the west coast of the continent to Alaska. 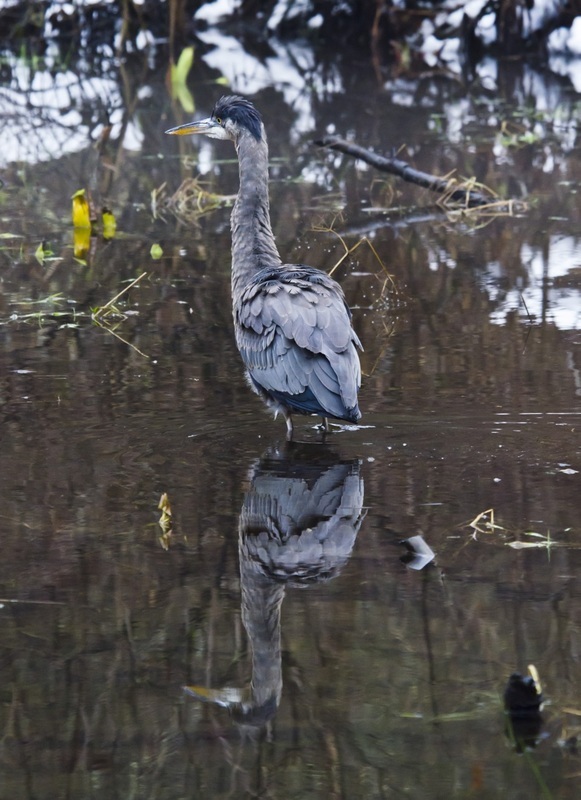 The great blue heron can be confused with the sandhill crane (Grus canadensis), another large long-necked bird. The heron lacks the bustle of feathers the sandhill crane has at its rear and also flies with its neck curled in and legs stretched out behind, while the crane stretches its neck out during flight. 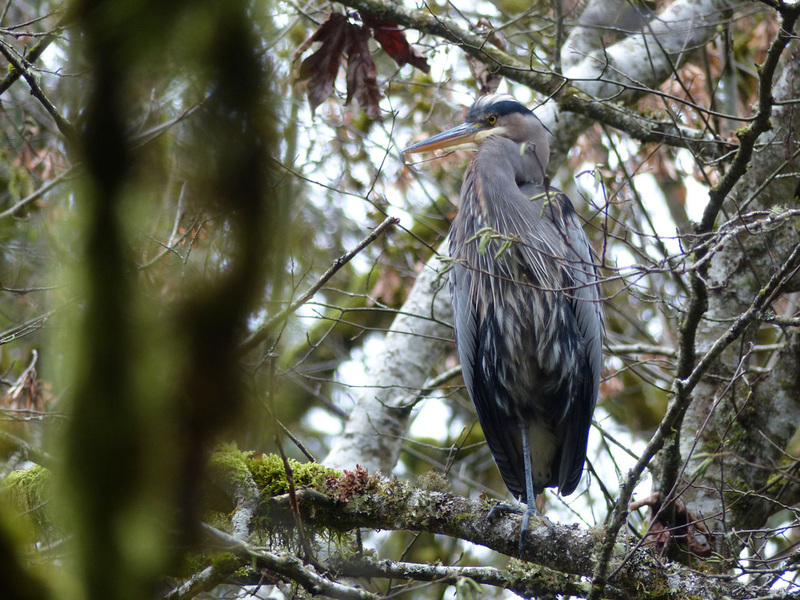 The heron is also more blue in colour, with a yellow beak and legs, as opposed to the sandhill crane's grey-black beak and legs. The sandhill crane is only on the Central Coast in the summer breeding months. 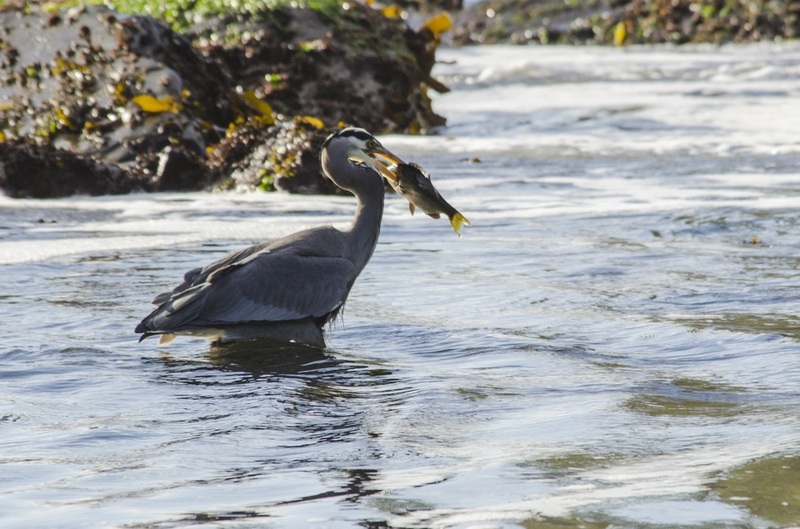 The great blue heron is not a picky eater: it will snag fish, amphibians, small mammals, birds, reptiles, and insects with its yellow bill. It breeds and nests in colonies with 500 or more nests built in trees or on other elevated structures. Some birds will also nest on the ground. Dunn, J. L. and Alderfer, J. (Eds.). (2006). National Geographic Field Guide to the Birds of North America. (5th Ed.). Washington, D.C.: National Geographic Society. Pp. 114-115. Great Blue Heron. Ardea herodias. The Birds of North America Online (A. Poole, Ed.). Ithaca: Cornell Lab of Ornithology; Retrieved from the Birds of North America Online. Accessed 21/04/2013.